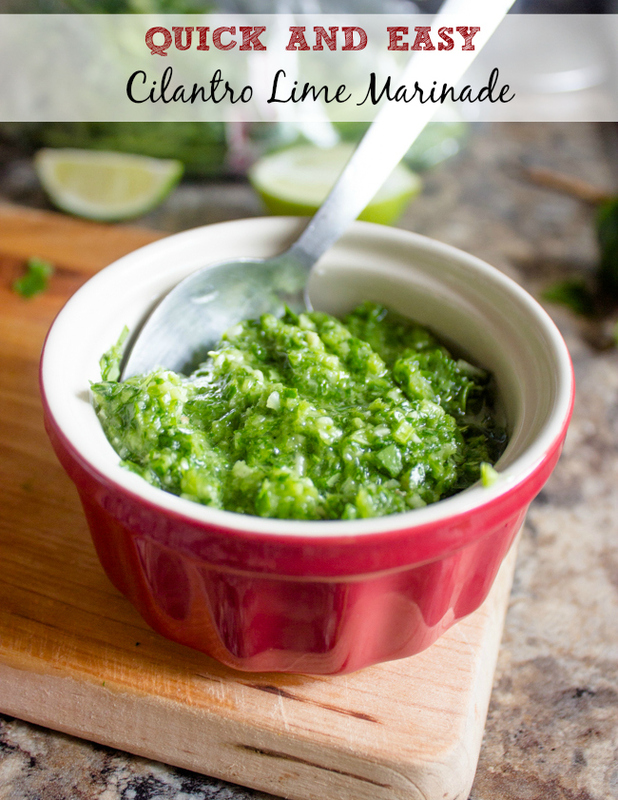 If you love Mexican food your going to love this cilantro lime marinade. It’s really easy to make and can be used to marinate chicken, beef, fish, shrimp, and even vegetables. I recently made a batch of roasted potatoes with this marinade and it was so good! 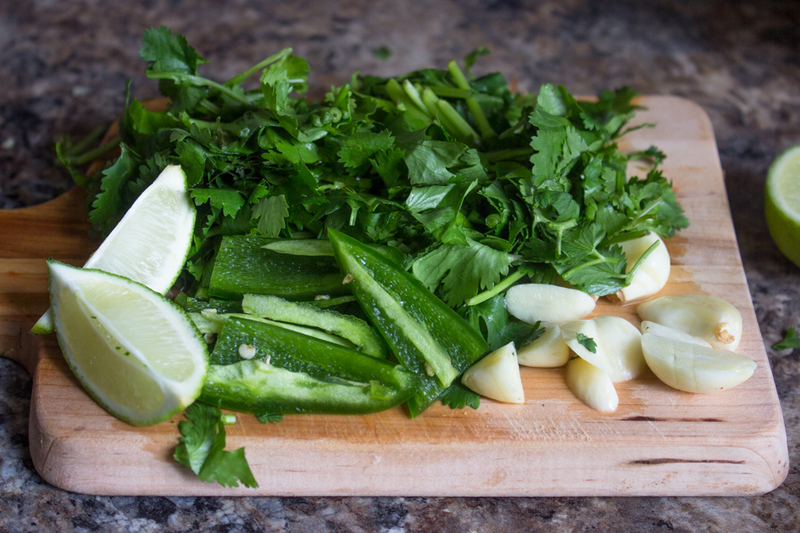 To begin light chop the cilantro, garlic, and jalapenos and toss them in the food processor. Add the lemon juice, olive oil and salt & pepper to taste. Process for less than one minute or until you have a nice and chunky texture. Don’t over process because the mixture will turn into a paste rather than chunky. The jalapenos are not mandatory but they add a wonderful flavor and a kick of spice. If you don’t want the marinade spicy remove the inside of the jalapenos and wash them under cool water; be sure not to get any in your eyes. Combine all the ingredients in a food processor for less than one minute or until the texture is nice and chunky. Be sure the garlic is fully processed. 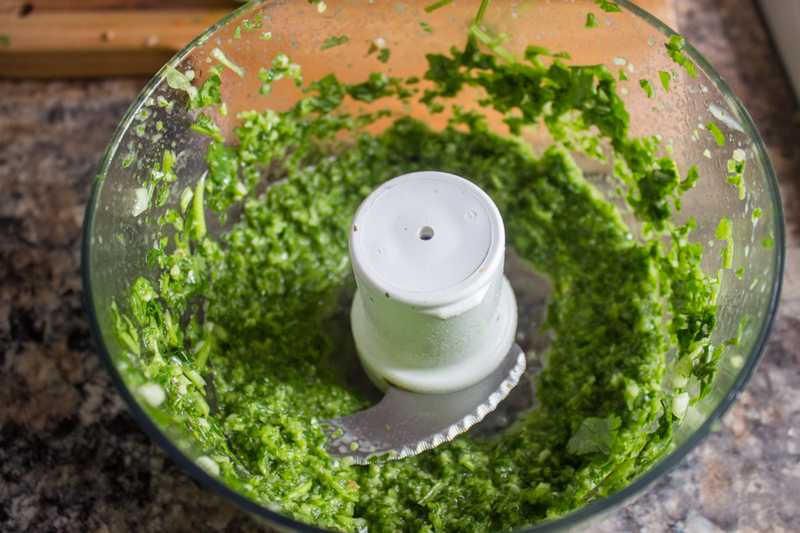 If you don't have a food processor you can make the marinade by dicing the cilantro, jalapenos and garlic very lightly and then mix the ingredients in a bowl with a fork. For a less spicy version, remove the inside of the jalapeno and wash it under cold water and be sure not to get any of it in your eyes. Store the marinade in the fridge for up to one week. 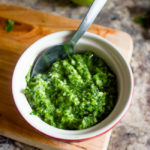 Great taste and easy to make with my fresh garden cilantro and jalapenos. i used my ninja to chop/blend. will make this again and again! i used it on pork loin chops and grilled, but it would work in the oven well too! My daughter is getting married October the 28th we planned on having a taco bar for rehearsal dinner. So I am this recipe out this weekend and having a taste test. Excellent! Fresh and lively. Perfect on my carne asada. Many thanks! Looking forward to using this marinade on chicken. How long would you suggest marinating chicken breast before cooking? Yum, sounds good with chipotle! Wow, so good! I only made half a batch in case my picky husband didn’t like it. It still made quite a bit! Good thing, because he loved it. I first marinated salmon for the grill with it. And there was till so much left over! I put the rest in 1 inch silicon ice cube trays and froze it. Then popped them out into a freezer bag. We haven’t used it to marinade anything since. We grill out meat of choice and as soon as it comes off the grill each piece gets topped with a cube that has been slightly thawed, to slushy consistency. It melts down over the meat. So, SO good! I just used the last 2 cubes, so looked up the recipe to make a full batch this time. Thank you, Layla! just made this to use on chicken for burrito bowls and it smells great! “Add the lemon juice, olive oil and salt & pepper to taste. Process for less than one minute or until you have a nice and chunky texture. Don’t over process because the mixture will turn into a paste rather than chunky. I took it to mean, pulse until chunky, like minced, not a paste. Hello and thank you for sharing this recipe with us! I love Chipolte bowls and searched for the recipe. Yours came up and then I saw the link to the lime Cilantro Lime marinade. It is simple, quick and absolutely DELICIOUS! I’m marinating the steak now. I will be using this with various recipes in the future. Thank you! WOW! I tried this before when making steak burrito bowls and it was delicious. I tried it again this week but with shrimp—AMAZING! Absolutely AMAZING. My husband and I liked it so much that we were bummed when the kids liked it (we were hoping we could eat theirs). Hi layla! This was such a easy marinate, yet so yummy in alot of dishes add ons! Thank u!!! i love your recipes!!! This bright marinade definitely caught my eye! 🙂 It sounds amazing! I can imagine how good it tastes on so many things. Pinned! So refreshing and beautiful! I’ll put on everything too! Hi Layla, this is one of my favorite combinations of flavors, this would be good on so many things. Pinned! I love the pop of color in your pictures! 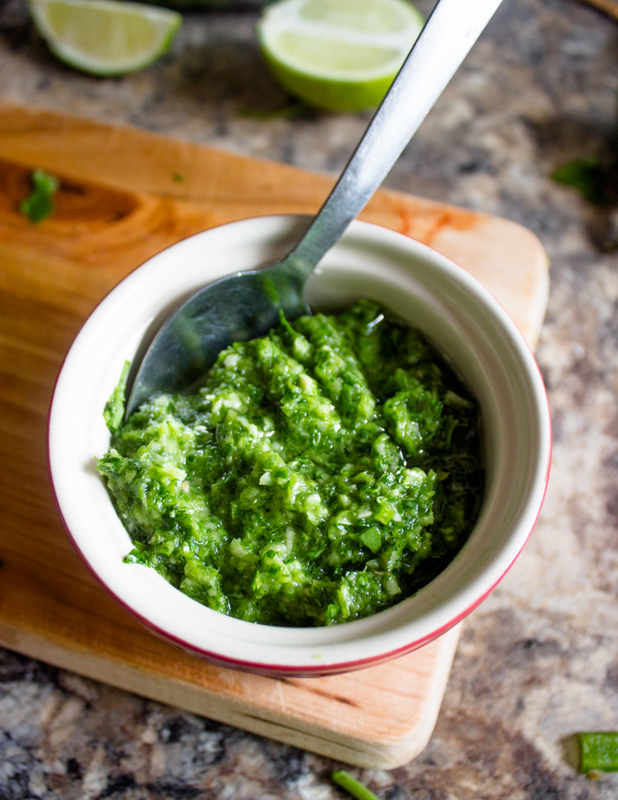 And I’m all about cilantro, so can’t wait to try this as a marinade! Pinned!